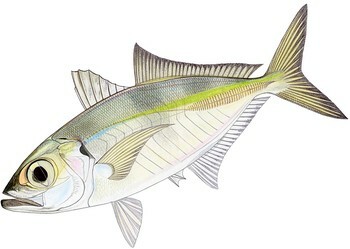 Mackerel scad and big-eye scad are members of the jack family and both have a circumglobal distribution. They are schooling fishes found in deep lagoons, coastal bays and offshore waters; in Hawaii they are caught nearshore, using a variety of coastal gears. Both species are primarily consumed locally, and these fisheries have little impact on the surrounding ecosystem. Current abundance and fishing mortality levels of big-eye and mackerel scad are currently unknown, as no assessment has been conducted since 2000. However, catches have been stable since this time and both species are short-lived and fast growing, which makes them inherently resilient to fishing pressure. Past assessments suggest stocks were healthy and not overfished. Overall, management of the Atlantic herring fisheries is highly effective. These fisheries are limited access, where the number of vessels that can participate in the fishery is capped at a certain level based on historical participation. Data are readily available, and the fishing limits are set based on ongoing stock assessments. Understanding and monitoring the impacts of herring fleets on other species is of equal management concern and attention. Bycatch in these scad fisheries is very low. In cases where bycatch does occur, the bycaught species is often the other species of scad. Discards (fish thrown to back to sea) are slightly higher in the big-eye scad net fishery compared to the other fisheries, but most of the discarded catch is big-eye scad, not other species.